Pamper yourself or gift your loved ones! Gracefully woven by skilled artisans using artificial silk threads, this saree makes a perfect addition to the wardrobe for all occasions.This saree comes with an unstitched blouse piece measuring 80cms.Slight variation in color may be possible due to photographic effects. Quality check done. 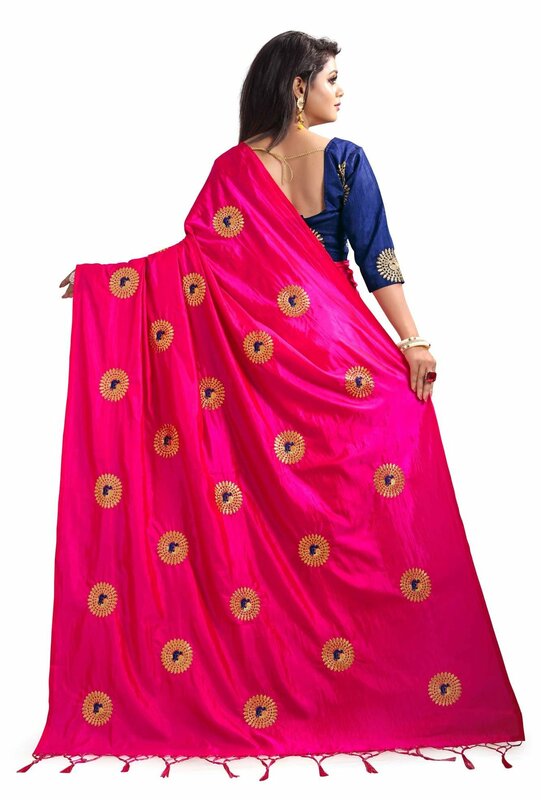 From the manufacturer View larger Stylish Traditional Saree For Indian Occasions We offer a variety of sarees like silk, crepe, Tusser silk, saree party wear, new collection sarees etc Wear this saree with tradition, feminism, serenity; which gives fashionable, traditional look. They are manufactured keeping all the ages and occasions in mind. They are traditional, but they are youthful as well. Whether it is a party wear, festivals, or wedding, this Cotton Silk saree will surely add extra charm to your personality. Gorgeous Golden border saree is well crafted with high-quality saree party wear Art Cotton Silk Fabric soft, heavy Zari work border with pallu Cotton Silk, comfortable to wear. Gracefully woven by skilled artisans using high-quality threads, this Cotton Silk saree makes a perfect addition to the wardrobe for all occasions.